This function is used to create a new access window tab page with the specified string. Hint: Do not use a long name for a the Page Label, as this is displayed on the Access Tab. 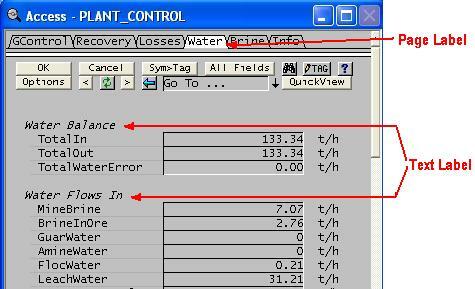 This function is used to create text description lines on the access window. For a blank line: TextLabel(). To insert a text label with a blank line before the label, specify a comma before the label: TextLabel(, "Water Flows In"). You can specify multiple lines with comma (,) separator: TextLabel("Alumina", "Area 5"). Do not use a tab in the string, it will be replaced with a single space.